A fully genetically-encoded approach to light-activated transcription is getting closer now that a new, generalizable method of light-switchable protein interactions has been published. In Nature’s advance online publication, Spatiotemporal control of cell signalling using a light-switchable protein interaction, Anselm Levskaya of the Voigt lab at UCSF and co-authors demonstrate inducible, reversible control of protein binding, localization and signalling in mammalian cells. apo-PhyB covalently binds to the chromophore phycocyanobilin (PCB) to form a light-sensitive holoprotein. PhyB undergoes conformational changes between the Pr and Pfr states catalysed by red and infrared light, reversibly associating with the PIF domain only in the Pfr state. This heterodimerization interaction can be used to translocate a YFP-tagged PIF domain to PhyB tagged by mCherry and localized to the plasma membrane by the C-terminal CAAX motif of Kras. The only real caveat for in-vivo work is delivery of the non-native PCB tetrapyrrole. From the literature and my experience with cell culture I suspect it shouldn’t be hard to just administer it directly to animals to get saturating levels for holoprotein formation. It might even be possible just to feed animals Spirulina (where it comes from). There’s nutrition literature that suggests their livers are capable of freeing PCB and getting it into the blood stream. 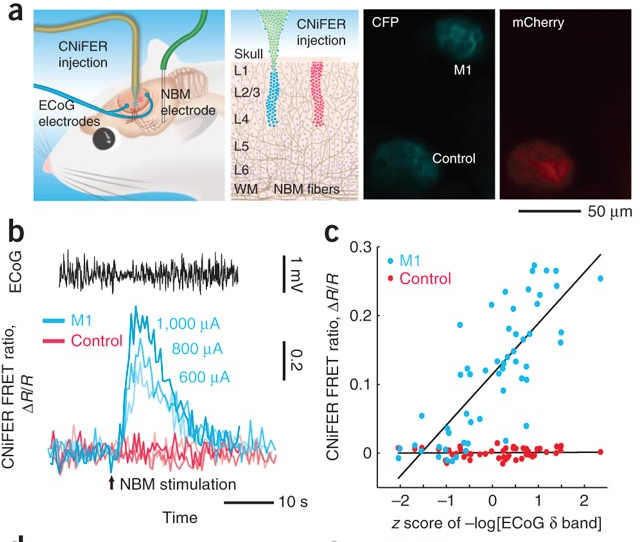 Expression of genetic tools that control neural activity (Channelrhodopsins, Halorhodopsins, DREADDs) in functionally defined populations, such as neurons that are active during a particular task or thought, is the next big leap that needs to be made in systems neuroscience. This may be achieved by combining an imaging technique to identify active neurons, such as G-CaMP3, with photo-switchable transcription. The technique presented in the above paper is one promising avenue which may lead to cell-specific photo-switchable transcription. Once robust versions of these tools are in place, scientists will begin to work out the complex and thrilling processes of reverse-engineering and manipulation of specific thoughts and memories, at least in mice and rats. The authors were able to get robust gene expression with standard UV irradiation, but also were able to uncage sufficient cyanodoxycycline with two-photon illumination to cause highly localized gene expression in cultures. In live tadpoles, they stuck to UV for the greater efficiency. The standard caveats of the tet system apply. The off-state still has a bit of residual gene expression, which is fine for some applications (like fluorescent tagging), and a dealbreaker for others (cre induction). Drug delivery takes time and comes with diffusion, penetration and clearance issues. UV penetration through deep tissue is going to be a big technical hurdle to overcome to apply this to full-grown mammals. Blasting living tissue with high power UV usually isn’t a good idea. Despite these caveats, the system clearly works and I’d bet the authors are already applying the system to some next-step applications and biological questions. The potential of selectively turning on genes in functionally identified neurons via light is enormous. It is one of the most likely eventual avenues into possible optical activation or suppression of specific thought patterns (at least if you are willing to squirt virus into your brain and eat a bunch of nasty antibiotics).